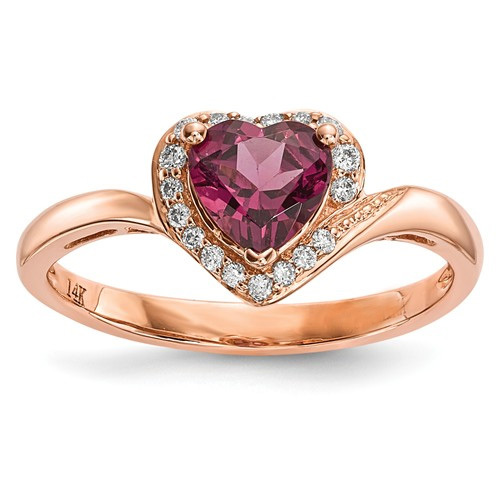 A genuine red rhodolite heart-shaped garnet gemstone is feature stone on this uniquely crafted 14k rose gold diamond and heart ring, from Apples of Gold Jewelry. The center garnet is a full 1 carat gem measuring 6mm in size. The diamonds surrounding the heart-shaped gem are 0.11 carats total. 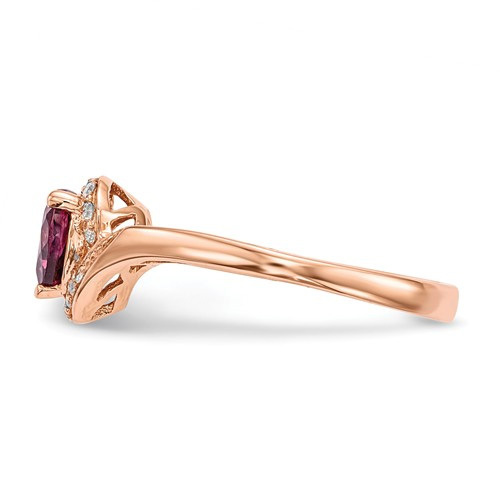 The ring's band measures 2mm wide and is made using authentic 14k rose gold. Available in women's sizes 5-9, including half sizes. The perfect gift for Valentine's Day or any time of year, for birthdays, special occasions, anniversaries, or just because you love her. Treat yourself and your love to something unique that is made using all genuine precious materials. We guarantee our 14K Rose Gold Garnet Diamond Heart Ring to be high quality, authentic jewelry, as described above.